Classic. I have that pellet rifle (No. 3). Winchester Model 427. (Made by RWS in West Germany, I believe). I don't think I saw this particular add, but I grew up seeing many like it! Purty much(during my infamous youth) all the boys, and many girls, evolved from BB guns to pellet guns to .22's to shotguns and heavier caliber rifles as they "matured". Everyone with a pick-up truck(which was almost everyone where I grew up in N. C.!) had a rack in the back window with shotgun and rifle. Though they certainly could be used for "protection", they rarely had to be, or were even thought of as such--mostly they were kept for hunting, target shooting(tin cans, bottles, rats at the dump, etc.--almost never an actual official-type target! ), and just general dinkering around with. I personally was never much interested in guns, and was considered odd for that(well, okay, for other behaviours too!.... ), but I just never "matured" or advanced beyond an interest in more primitive weapons--bows and arrows, spears, clubs, machetes, knives, etc. I did keep a muzzle-loading BB gun that shot crooked(to the right, if I recollect correctly) but ACCURATELY, if you understood it's eccentricity, and came in quite handy sometimes in various juvenile BB wars that broke out periodically among rival tribes of kids. Although my river cane spears tended to be far more decisive during such altercations! 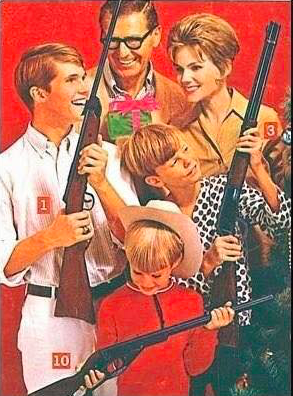 Despite this personal lack of excitement or interest in guns, I find it odder myself this modern, politically correct antipathy towards them--yea, downright FEAR of them, which comes mostly from ignorance, I believe.....L.B. I love the revival of 'story telling' adds that Marshall Radio has put out for their telemetry. I seek and collect sporting art featuring women. Especially falconry related.